Dr. Mathias Steinach will be back to conduct a study among MYAU athletes for the third time. He will study the effects the race has got on 430 mile runners and he is looking for participants. He already came for research in 2013 and 2105. In 2017 he will be back to get more data. Mathias works for the renown Center for Space Medicine and Extreme Environments Berlin which is part of the University there. Athletes who participate not only help understand better what extreme environments do to us humans in general. They will of course also gain very interesting insight on how our race affects their body. The study so far has gone really well. Mathias found a way to get all the data necessary without interfering with the race rhythm of the participants. Mathias will once again co-operate with Robert H. Coker from the Institute of Arctic Biology at the University of Alaska Fairbanks (UAF). Robert H. Coker, PhD is an Associate Professor at UAF and has over 17 years of experience studying the regulation of metabolism during exercise under a variety of different physiological scenarios. They are looking for 8 to 10 athletes who would like to be part of this. So, if you are interested, please send me a quick email (info@thegreatoutdoors.de) and I will get you in touch with Mathias. He can then provide you with a full outline of the study and answer any questions you may have. Our world can be a strange place. The current US election results, climate change, wars, refugee crisis, … Anybody in their right mind sometimes has to wonder. So, it’s great to see that there are people who care about others and help. Despite all difficulties. Many athletes dedicate their participation in the MYAU to a good cause. In 2017 and hopefully beyond I would like to help with the MYAU as well. Obviously, there are many causes worth supporting. However, one charity has really inspired me and even has a connection with the Yukon. It is called Little Footprints, Big Steps. Morgan Wienberg left the Yukon at age 18 to help people in Haiti after the devastating earth quake in 2010. What was meant to be a short trip changed her life and that of countless others. In 2011 she co-founded Little Footprints, Big Steps and has been part of it ever since. At a time in life when most people think about studies, career and all kinds of other things, Morgan decided to help rescuing children from situations of abuse, slavery, homelessness or severe neglect. Little Footprints, Big Steps do this by reuniting families, supporting education and opportunities for self-sufficiency and dignity through their programs and services and collaborations. A big advantage of Little Footprints, Big Steps is that it is a small charity with limited bureaucracy. So any support really ends up where it should. As you will know from the news Haiti this year once again has been hit by natural disaster. The funds we can generate will be used for agricultural restoration for families who live in more rural communities. Which is where the hurricane completely wiped out all agriculture crops. Little Footprints, Big Steps will buy gardening materials, compost, seeds/plants/baby trees and hire a local agronomist to guide the families. Also Morgen and her team will have the kids in their safehouses involved in doing reforestation projects. What MYAU will do is to pay CAD 1 per every kilometer run by our marathon participants. And we will think about other ways to generate more contributions. Ideas welcome! Of course any ultra-athlete who wants to join in the effort is more than welcome to do so. More news on this project will follow. Almost everybody travelling to Canada now needs to apply for an Electronic Travel Authorization (eTA) before the actual journey starts. I recommend going to the eTA Application to apply for your eTA. You will find all information there and the application process is pretty simple. Also, if you go through that website it is only CAD 7.00. If you go through an agency that deals with these kind of services you likely will have to pay a higher fee. In 2017 we will work with SPOT satellite tracking devices again. Because we do have a sufficient number of rental SPOTs available, the SPOT will also be mandatory for the 100 miles! As with any technology, there are pros and cons. But overall the positive aspects are more than the negative ones. The main reason we have SPOTs is for their 911 function. And thankfully, so far it has only been used a couple of times. The 911 button to us means there is an absolutely life threatening situation. This also means if there is no life threatening situation, IT CAN’T BE PUSHED! Please keep in mind that the cost for a 911 rescue operation can be enormous and it has to be paid by the athlete or his/her insurance. Obviously, if life is at risk it just has to be done. But if you are lost, tired, exhausted or have any other problem that a good rest and common sense can solve, do not push that button. If a good rest is of no help, there is a button on the SPOT that is called exactly that: „Help“. It is a signal to the race organisation that you do have a problem and want to end your race then and there. But otherwise you are fine and will wait for us to come. The third function that is great for us and all those following you at home, is the tracking function. If your SPOT has got good exposure to the sky it will send your position to us several times per hour. This will then be updated to a MYAU section on Trackleaders.com. The cons are that of course sometimes people use the „Help“-button when they really could have solved the problem themselves. Or they decided to use that button rather than going back to a checkpoint. Mind you, if you can’t walk anymore, that’s fine. Push it. But being tired is no reason. Please just take a good rest and decide then. Because if we have to „rescue“ someone who is actually perfectly fine and at the same time something serious happens, it is bad to have resources bound. Another con is that it’s technology and it does not always work. Usually this is due to not operating the SPOT correctly. But it also may be technical failure. It means we don’t get a signal and people back home start to worry. In most cases race headquarter knows what’s going on, e.g. because we got in-/out times of a checkpoint or just recently had contact with the athlete. Anyway, over all I would say the safety that SPOT brings to the race make it worth its while. For 2017 the rental fee (tracking service, shipment and set-up included) is EUR 50/unit. If you bring your own SPOT, the set-up fee is EUR 20/unit. All those of you who bring their own SPOT and did not tell me that already, please email me by end of November.If I have not heard from you I will assume you need a rental unit and I will order one for you. You do not want GEOS emergency response center to waste time calling family. You want race central to be the first call. If you are bringing your own SPOT we will need to get your ESN-Number which is in the battery compartment and the URL to your shared link page. Anyone using a SPOT – both own or rented – please keep in mind that you will need 4x AAA Energizer Lithium Ultimate (model # L-92) to power your device. The batteries are NOT included. Therefore, please bring these to the Yukon with you. Every year there are at least a few athletes who bring the wrong batteries, or partially used batteries. In the extremes of the Yukon, you are certain to experience tracker down time if you gamble on batteries. And the device may not work when you most need it. Last but not least, if you would like people to see what you look like when they go to the Trackleaders.com page and klick on your bib number, please send Matthew (heymatthewlee@gmail.com) a 150 x 150 pixels very tightly cropped headshot. If you have a DeLorme inReach you do not have to rent a SPOT. Trackleaders.com can include it on our race tracking map. In order to do so, we need the URL of your shared map. Please email as soon as possible. However, what I can’t tell you is how it works regarding distress messages. If you can set a profile it’s best if you use the same type of settings described above with SPOT. And make sure you have our contact details for getting in touch with text messages. Should you bring your inReach and not need a SPOT please let me know by end of November. Above I already talked a bit about SPOT and rescue. Now I just want to make sure everyone understands that no matter if it’s a „Help“ or a „911“ message, rescues in the winter wilderness of the Yukon will likely not be as quick as you would think. If a „Help“ message is sent or a checkpoint calls us and asks for transportation of an injured athlete from a remote checkpoint, it depends on various factors as to how fast we can be. If for example an athlete is in relative safety at that checkpoint and the weather is extremely cold and it would be a risk to send a ski-doo guide, then it will take as long as there is no more risk. In places like Dog Grave Lake or Ken Lake there may also be the need for air evacuation rather than ski-doo. Depending on the circumstances it can be safer and quicker for a plane to do the rescue there. PLEASE note that air rescue to 100% has to be paid by the athlete! Also, we try to avoid ski-doo rescue at night. So, if you push the help button in the middle of the night it is very likely that only in the morning you will see us arrive. Even a 911 mission can take hours. And again, if the weather does not permit, there is no air rescue at all. That is also, why it is so important to have basic survival skills, enough food, warm clothes and the right sleeping system. I will not talk about survival skills or what to do or not to do in serious or dangerous situations. There is a lot of interesting literature on the market and pretty likely you have read at least one of these books already. Or you may have had or will get survival training. In any case, it’s good to be prepared and think about certain scenarios and what you will do. 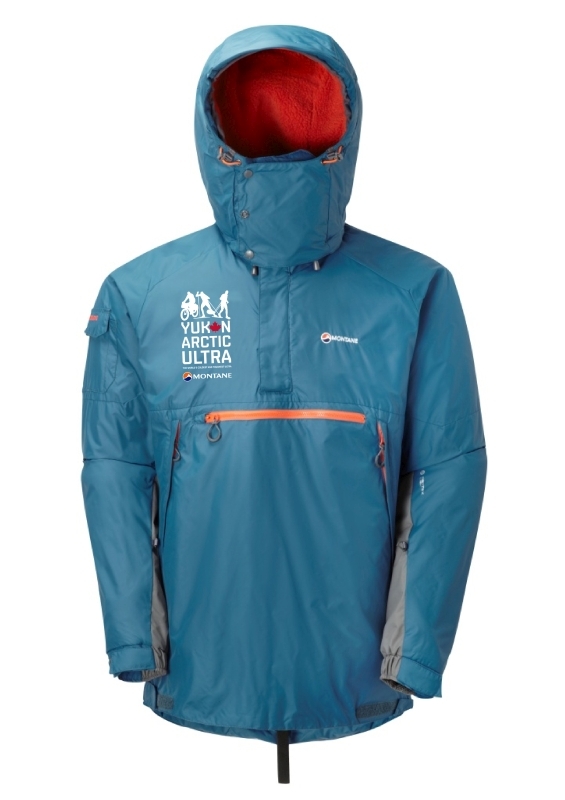 I finally found a company that does high quality prints on functional clothing (as the one I had worked with before went out of business …) So, now I am getting new MYAU Montane Extreme Smocks with our race logo made. It will sell for EUR 150 (RRP is EUR 189.95). If you are interested, please let me know. I will get logo patches made again soon, too. 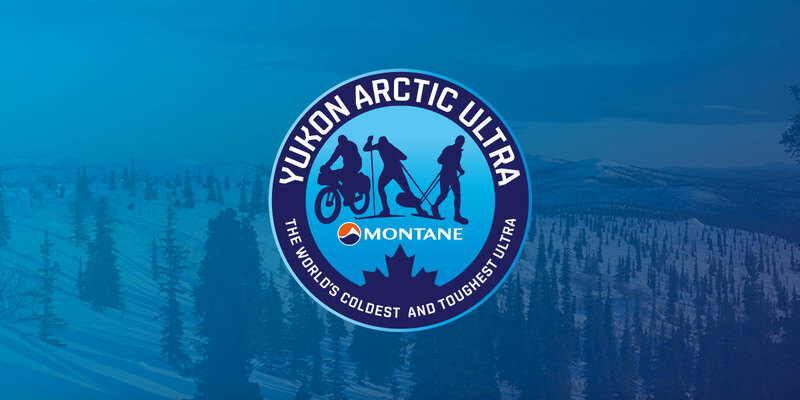 © 2019 YUKON ARCTIC ULTRA.